Agricultural scientists at Pennsylvania State University found a way of identifying and tracking strains of antibiotic resistant Salmonella bacteria through the food supply chain, even if the strain evolves. The team from the lab of food science professor Edward Dudley describes the technique in the September issue of the journal Antimicrobial Agents and Chemotherapy (paid subscription required). Doctoral candidate and lead author Michael DiMarzio investigated the transmission of Salmonella Typhimurium, a strain of the bacteria that the university says accounts for 15 percent of the Salmonella infections in the U.S. The Centers for Disease Control and Prevention (CDC) found the bacteria earlier this year in tainted ground beef and has a current advisory warning of Salmonella Typhimurium outbreaks connected to handling of live poultry. The CDC even found the strain last year spreading through microbiology labs. The Penn State researchers adapted earlier research in Dudley’s lab investigating genes that contribute to the bacteria’s virulence. They particularly focused on regions its DNA called clustered regularly interspaced short palindromic repeats, or CRISPRs found in many foodborne pathogens. DiMarzio and colleagues studied CRISPRs in frozen Salmonella Typhimurium from cows, pigs, and chickens in the university’s animal diagnostics laboratory, and isolated 84 unique samples stored between 2008 and 2011. Their research shows several sub-types of Salmonella Typhimurium show up repeatedly in those samples. 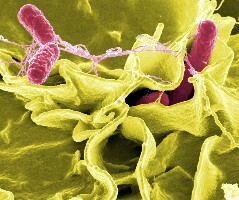 The researchers then examined samples of Salmonella Typhimurium CRISPRs taken from humans, and as they expected, found a good deal of overlap between the sub-types in humans and many of the animals. Those subsets, say the researchers, are also those that seem more prone to antibiotic resistance. With CRISPRs, the Penn State team was able to identify and track 22 sub-types of Salmonella Typhimurium by their propensity for resistance to seven common antibiotics used in human and veterinary medicine. Five of those sub-types were subsequently identified in the human samples, with identical resistance patterns appearing in some of the human and animal samples, providing evidence of those sub-types spreading through the food supply chain. The researchers next plan to delve into the factors behind some strains becoming resistant to antibiotics, while others remain susceptible.